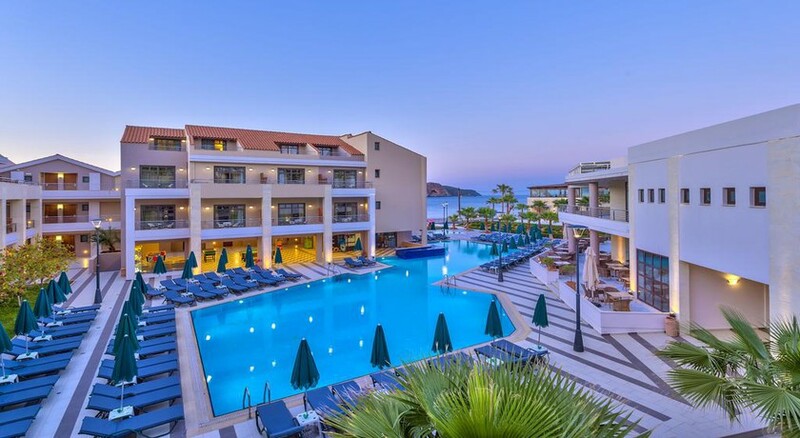 The excellent 5-star Porto Platanias Beach Resort and Spa in Platanias is an absolute paradise for beach lovers. The most attractive tourist destinations in the area include the Aghia Marina beach, the Goat Island Theodorou, the Gerani beach and the Maritime Museum. This beachfront hotel is a family-friendly hotel. Inaugurated for visitors in the year 2000, the hotel is located within a beautiful garden area and has a total of 322 rooms, including 4 suites, a junior suite and three rooms equipped for the disabled. Hotel facilities also include a cafeteria, a kiosk, a small market, a shop, a hairdresser, three bars, an air-conditioned à la carte restaurant, three conference rooms, a car park, a garage and a playground. You will have at your disposal wheelchairs, in case you are travelling with guests with special needs. For children between the ages of 5 and 12 there is a babysitting service available at the kids club. 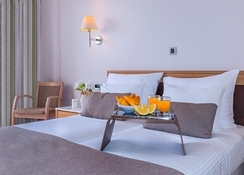 Porto Platanias Beach Resort & Spa is located in one of the quietest and idyllic areas of Platania, separated from the clean and beautiful beach only by a road. The center of Platania, where you can find a lot of shops, bars, restaurants, nightclubs (about 100 meters) and a bus station (150 meters), is nearby. The nearest big city is Chania, which can be reached by public transport in about 20 minutes. Other cities that are worth visiting are Souda (17 kilometers), Samaria Gorge (to about 48 kilometers) and Falassarna (to 42 km). Chania airport is 30 minutes away and Heraklion airport is about two hours and forty minutes away. 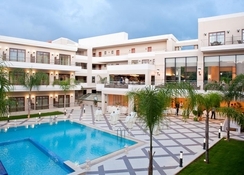 The hotel offers a total of 322 rooms for its guests. 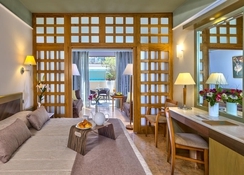 Guests can choose from Double Rooms, Studios, Maisonettes, Apartments, Superior Maisonettes, Standard Suites, Junior Suites with private pool, an Executive Suite and a Presidential Suite. The comfortable and cozy rooms have a marble bathroom with a shower and a hairdryer. 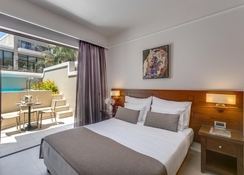 In addition, they have direct dial telephone, satellite or cable TV, Wi-Fi Internet connection, mini-fridge or mini-bar, safe for rent, balcony or terrace and air conditioning and heating, both adjustable. The family rooms have the same equipment but also offer views of the pool or the garden. The suites also have a living room with two sofa beds. For your dining pleasure the hotel offers a full American breakfast as well as dinner buffet. The staff also organises special themed nights. Enjoy a mix of house wines, spirits and cocktails at a total of five bars, as you round off the evening in a cosy atmosphere. Refreshing drinks can be taken directly at the pool bar. Guests are welcome to visit the fitness center, hammam and steam room. Here guests will find a pool area with indoor and outdoor swimming pools. In the beauty area, a wide range of massages are available for guests. If you are interested in sports, the hotel offers games like squash, table tennis, billiards, bowling, darts, mini golf and volleyball is available on the hotel grounds. The child friendliness of the hotel is reflected by a dedicated on-site children's playground. There is also an opportunity to go horseback riding in the vicinity of this hotel. Really good, Enjoyed my time there. Would recommend it to friends and family.